Welcome to the continuation of SAP Business Objects WebI tutorial. If you reached this page directly, please read the Part 1 first before proceeding. 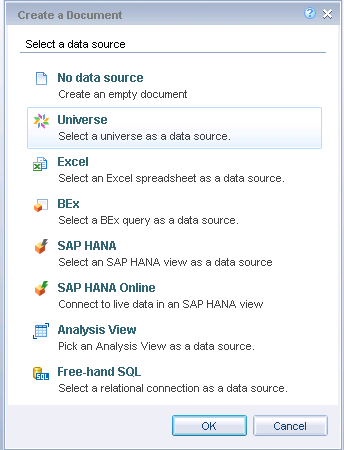 To show you how the other connection options work, let’s choose Universe instead of the SAP HANA Online option. This opens up the list of universes available in the repository. We’ve created a few in our previous tutorials. Let’s use the TMH_UNIV_NEW universe in this example. Let’s use the filter to find it. Filter search should show you your universe. Double click on it when you find it. This opens the Query panel. 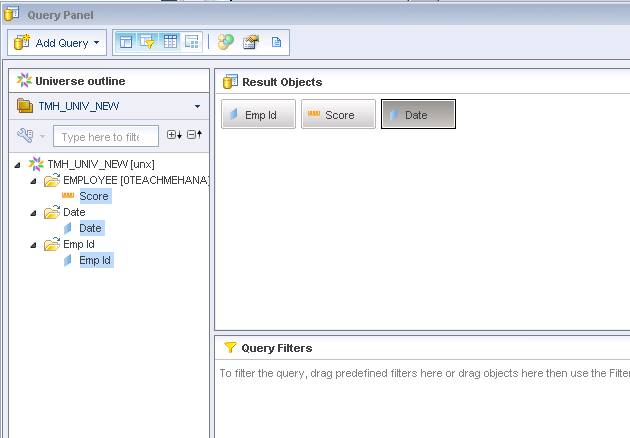 Note that you did not get this in the SAP HANA Online option and is one of the drawbacks of using that option. There are many complex design options especially the “Query Filters” pane. The left side again, shows the list of fields available in the source. Expand the folders to see the dimensions and measures. 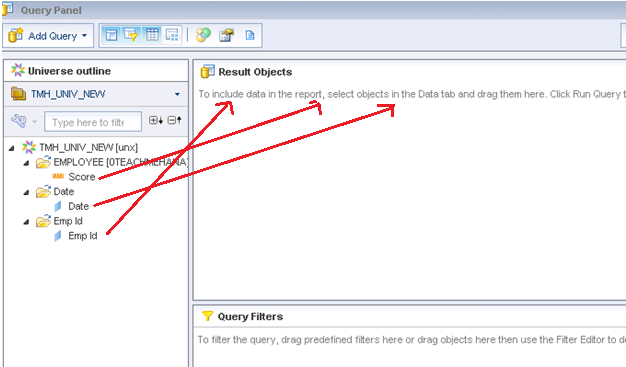 Pull these fields into the Result Objects pane in the order which is desired in the report. Once done, it would look as below. 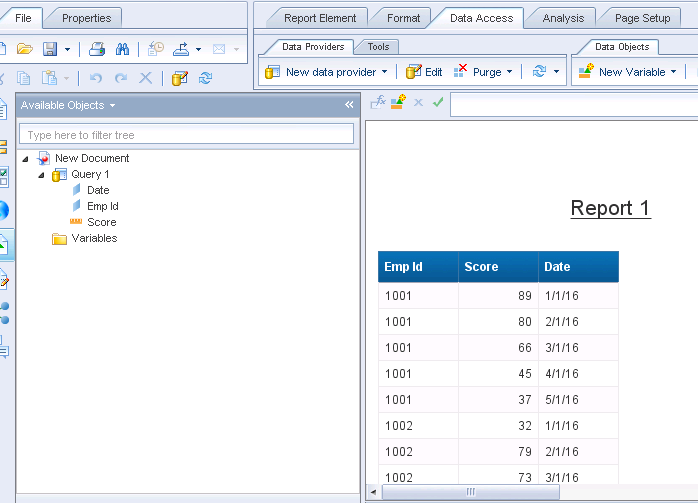 Once done, click on the “Run Query” to execute this report design pane. Here, we reach the similar place as we were earlier in our previous example with HANA Online source. You can of course insert charts here and do more complex this as your heart desires. 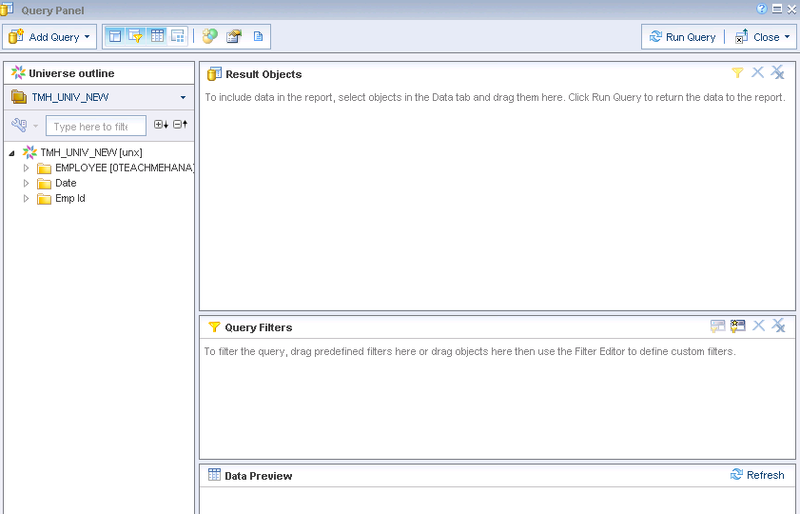 This was how we create different reports on SAP Business Objects WebI using SAP HANA as source. To summarize, if you are on a Business Objects version less than 4.2, you would have to create and use a universe as the middle layer to connect to a HANA view. 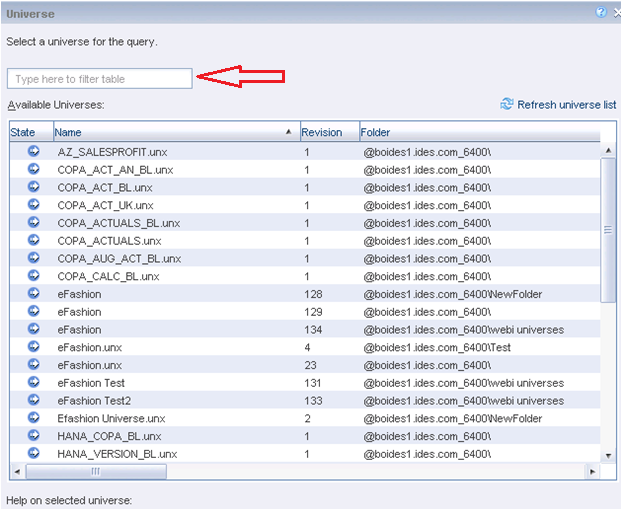 If you are on or over version 4.2, there are 2 options to directly connect to the SAP HANA views. If you choose the online option, you would not get the query panel and associated features but get faster performance as a byproduct. So basically what you use and how you use it requires a bit of thought and that’s what being a HANA architect is all about. You’ll all get there.. with time and practice. Share a tutorial to support us please. It’s free and I need traffic to sustain the servers.